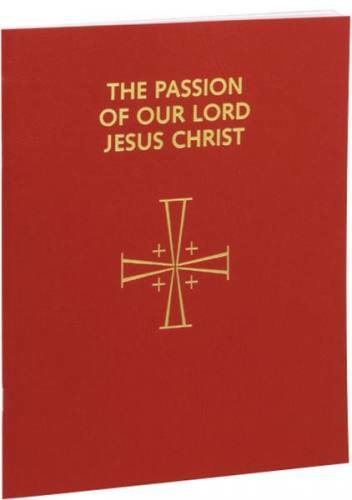 The Passion of Our Lord Jesus Christ from Catholic Book Publishing contains the Shorter and Longer Forms of the Passion for each of the three Cycles A, B, and C (Sts. Matthew, Mark, and Luke) for Palm Sunday and the Passion according to St. John for Good Friday, complete in one volume. Includes a handy calendar listing the cycle to be used for each Palm Sunday for the next several years. The Passion of Our Lord is arranged for recitation by several ministers. Featuring large, bold, easy-to-read two color type, arranged in "sense lines" for ease of delivery, on durable paper (thick, easily turned, very opaque), this lectionary is not only practical and functional, but beautifully printed as well. Suitable for the singing of the Passion by three deacons, as is traditional.